We are delighted to introduce you to New Music – New Methods, a new exciting initiative from the Education, Community and Outreach Programme of the National Concert Hall, running alongside What? 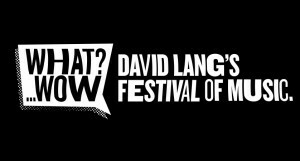 Wow – David Lang’s Festival of Music presented by New Music Dublin at the start of 2015. New Music – New Methods will provide music students with the opportunity to explore alternative processes of music making through a series of facilitated workshops leading up to an informal performance on 7th March, during the What? Wow festival. We’re looking for young musicians from the age of 15 upwards who are at least at grade 6 or equivalent standard on their instrument to take part in these workshops. An enthusiasm for creativity and an open mind to new approaches to music making are essential, and there is no charge for participants. We would be very grateful if you could please circulate this email to your colleagues and students, more information and application forms can be found here.